So I have a budget blade, I don’t remember the maker but it’s fittings arnt used in the market anymore or are always set with a blade with a bo-hi. I have a custom nodachi I had made and it’s currently the jewel in my collection. So I want to take my budget katana that was the first functional sword I ever bought, and doll it up to match its bigger meaner brother. Anyone know sites so I can purchase new fittings or get material to make my own? I would prefer to just get new ones and slap them on and call it a day, due to lack of proper tools or space. If anyone wants photos of both swords in question I’d be happy to supply them. Yeah, that is a similar to ehat they sell, maybe slightly better finished. I found the seller mazin55go, but it really seems funny that a Japanese seller would be selling Chinese fittings without saying that they are made in China. It seems to me he wants the buyers to assume that they are genuine Japanese pieces, but you can get the same stuff from Arts-feng for a quarter of the price. Good points, I honestly could not tell you where they are made, but I can tell you with a pretty good strike rate if they are fakes. 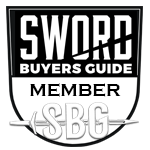 Im guessing if people are buying Tsuba or fittings as a collection they will already know they are fakes and if they are buying for mounting and use, they probably don't care as long as they look ok.
Im glad you mentioned about the price being high, I have never really been in the market to buy new repro stuff, but I kept an eye on that seller as he had a decent range of ok looking bits. Ill check out arts feng now too. My issue is usually shipping cost to Aus + product cost (in USD) is usually more than the higher priced/free shipping stuff. Hey no problem. A lot of his (or maybe her?) stuff is kind of gaudy, but I always got good customer service. a couple of other sellers that i've purchased from are lqshijian2014 and mirxu2014. Theres always new ones popping up, but I always wait until they've been around at least a couple years.